Approximately 5" x 3" notebook with only three pages of writing and the name Elizabeth Randall on the front and back covers. 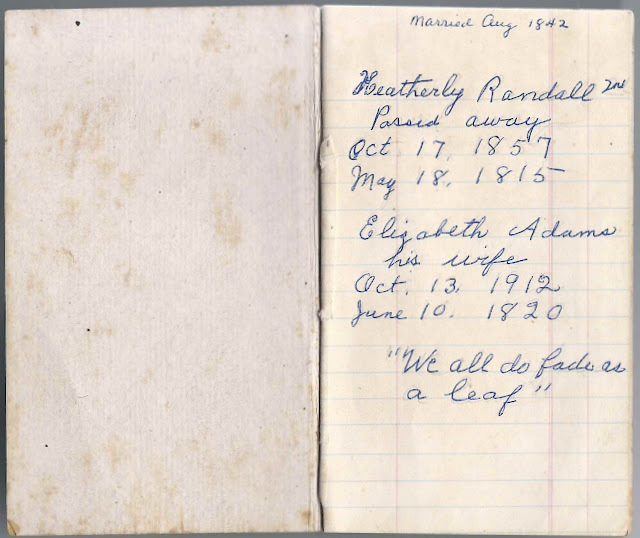 The page below gives the birth, marriage and death dates of Hetherly Randall and wife Elizabeth (Adams) Randall; the writer spelled his name as Heatherly, though most records I found spelled his name as Hetherly. Presumably the notebook belonged to Elizabeth (Adams) Randall, or to a namesake descendant. The writing seems to have been done with a ballpoint pen, and although they were around in a more primitive form before Elizabeth (Adams) Randall's death, I'm not sure about this particular application. Hetherly Randall's birth date is shown as May 18, 1815, and his death date, October 17, 1857. Elizabeth Adams' birth date is shown as June 10, 1820, and her death date as October 13, 1912. 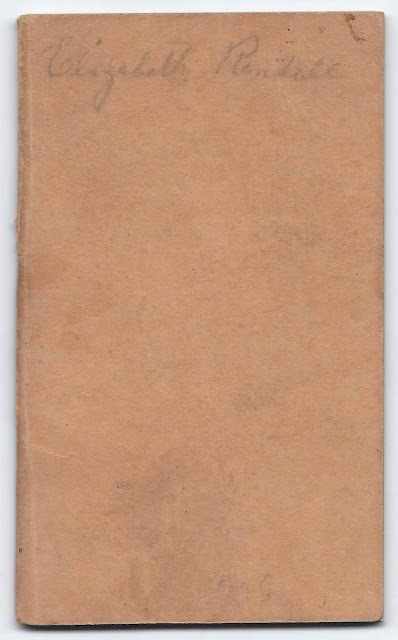 The page also shows that they were married in August, 1842. "We all do fade as a leaf." Hetherly Randall was born at Bowdoin, Maine, the son of Isaac and Thankful (Purrington) Randall. Elizabeth Gordon (Adams) Randall was also born at Bowdoin, Maine, the daughter of James and Sarah (Carr) Adams. Most of the notebook is filled with empty lined pages, but near the end there are two pages of accounting for Z. S. Varney and Joseph Elliot, from February 1871. Zacheus S. Varney was born 14 March 1830 at Bowdoin, Maine, son of Hiram and Thankful (Small) Varney. He married Charlotte Williams, daughter of Moses and Melinda (Carr) Williams. Zacheus died 14 November 1909 at Bowdoin, Maine. Assuming I have the right Joseph Elliot, he was born 3 June 1820 at Bowdoinham, Maine, son of Stephen and Rebecca S. (Allen) Elliot. He married Lydia Ann Brooks, daughter of Ara and Hannah (Briggs) Brooks. Joseph died 5 June 1893 at Litchfield, Maine. 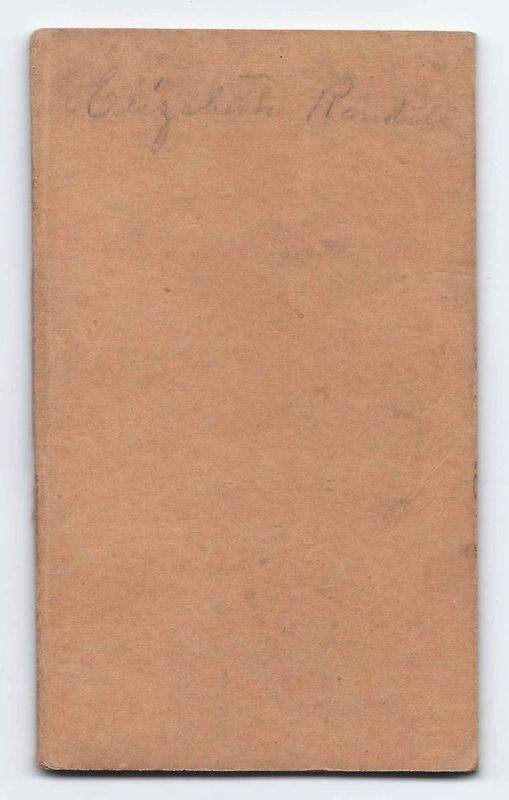 The inside back cover may also have been Zacheus S. Varney's figuring. 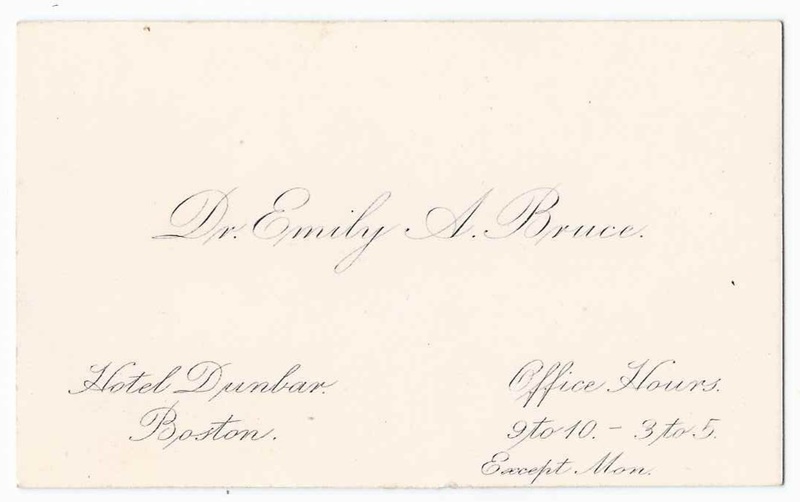 Tucked in the notebook was the business card of Dr. Emily A. Bruce at the Dunbar Hotel at Boston, Massachusetts. Emily (Allen) Bruce was born on at Wolfeboro, New Hampshire, about 1837, the daughter of Ebenezer and Mary F. (Nute) Allen. She married George Ellis Bruce on 3 December 1866 at Boston, Massachusetts. 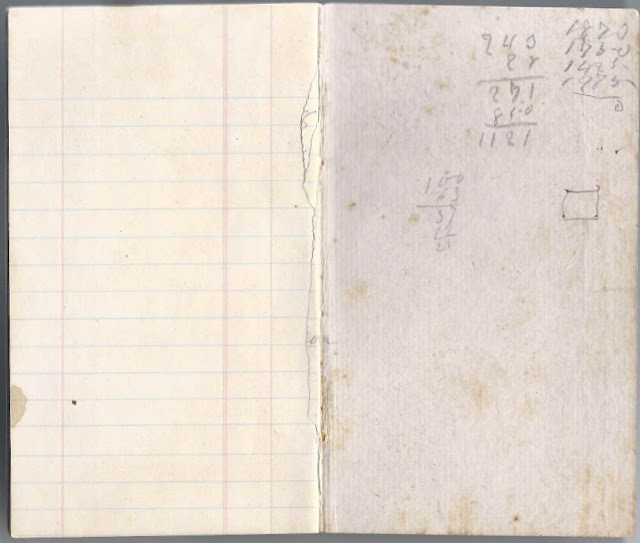 Emily and George had two sons, Herbert B. Bruce and George A. Bruce, but, sadly, the boys and their father all died between 1871 and 1873, making what must have been a terrible trial for Emily. She may have been a doctor beforehand, or perhaps the loss of her family prompted her to become a homeopathic healer. I found the snippet, shown below, in The Hahnemannian Monthly, Volume Thirty, January to December 1895. Here's another interesting snippet in the San Francisco Call, issue of June 18, 1894. 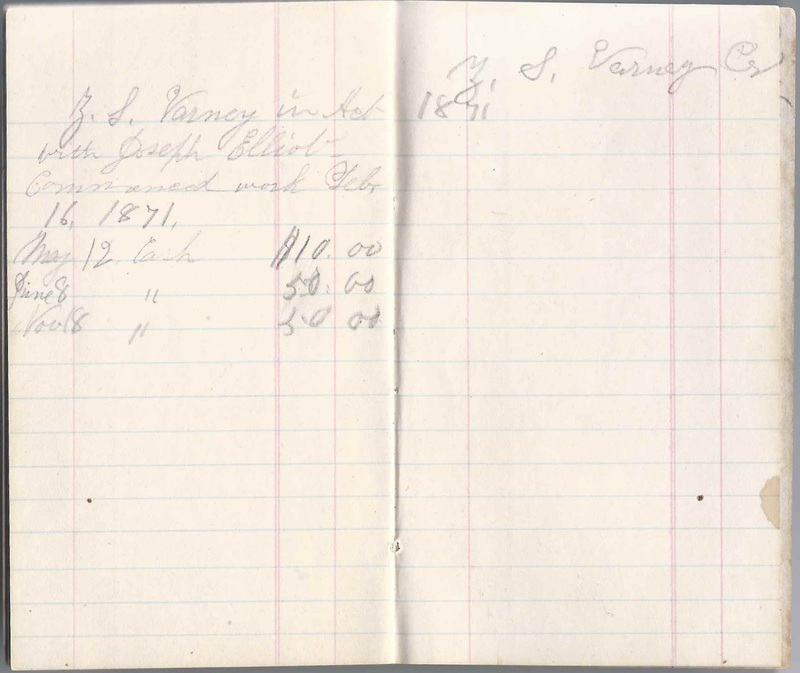 There's a Bowdoin, Maine, connection between Hetherly Randall, Elizabeth Gordon (Adams) Randall, Zacheus S. Varney and Joseph Elliot. And there's a possible Allen family connection with Emily, but it's also possible that Dr. Emily A. (Allen) Bruce had no close connection with the Bowdoin folks except that one or more of them had sought out her medical services. If you have corrections and/or clarifications to the information above, please leave a comment or contact me directly. Thank you so much! 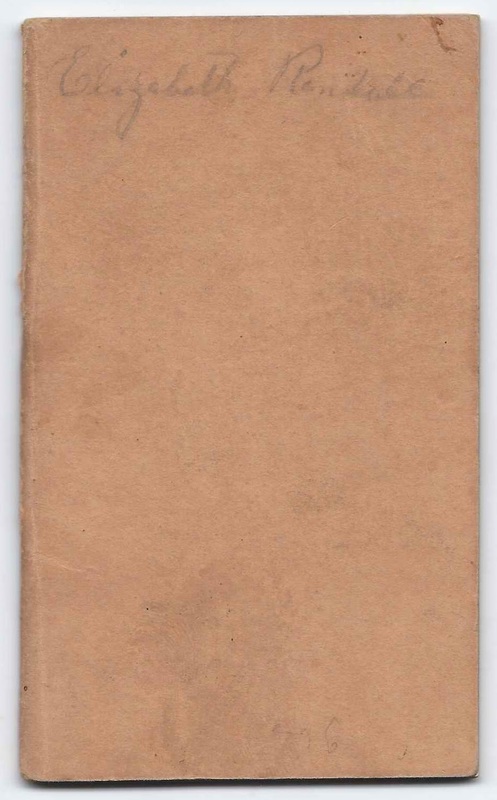 I've been looking for leads on Hetherly and Elizabeth Randall! Glad you chanced upon the post!